Yesterday, I attended an official Bernie Sanders rally to see him speak. It was at the Key Arena, a rather large venue build to house over 17,000 people. 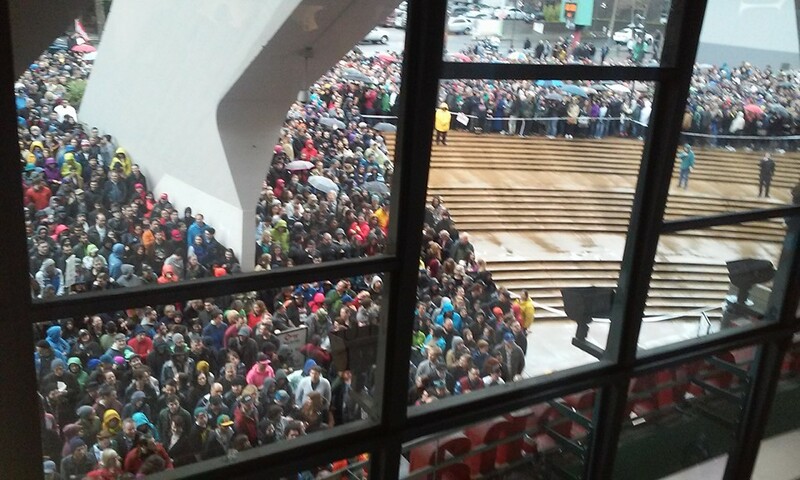 My friends and I got there at 12:30, having heard the doors would open at noon and the event would begin at 2. As far as I can tell, the doors opened at about 1:00, though it's hard to tell because the large mass of a line began moving soon after we got there, but it was hard to tell if that was from scrunching or because of the very slow trickle of people being let in by the Secret Service. Only two doors were open, presumably because those were the only ones with metal detectors. I don't know what kind of terrible planning allowed this to happen, because no one should have been surprised that 20 to 30 thousand people showed up for a Bernie rally in the city of Seattle. Bernie rallies are notoriously huge and Seattle is a big liberal city. Some people were grumbling that this was done intentionally to encourage Bernie supporters to turn away, speculating on who owns the Key Arena. It's actually owned by the City of Seattle, but operated by AEG, which is owned by The Anschutz Corporation, which is owned by Philip Anschutz, a conservative billionaire. So yeah, it's plausible. 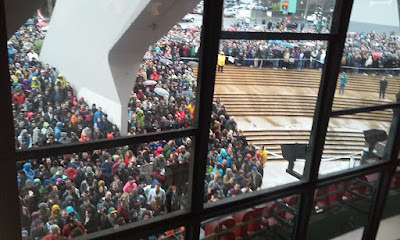 It took us nearly three hours to get inside, standing in the Seattle drizzle that never ends, and we were definitely more toward the front of the line than the back. Some people never got inside. 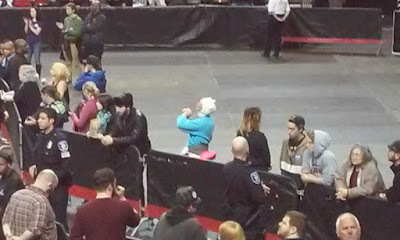 Instead, when Bernie arrived at the Key Arena, he first spoke to the people standing outside in line so that they could get some Bernie at least. Apparently something very similar happened in Vancouver, WA just a couple hours before that. Before Bernie arrived, members of the Tulalip tribe were kind enough to come onto the stage and perform the "warrior women's song." I absolutely love that the Bernie campaign invited indigenous women to specifically come and celebrate indigenous women. Before that, a representative for an LGBT+ group gave a speech urging people to volunteer for the Bernie campaign. And the person introducing Bernie was also of a local indigenous tribe. He was quite young, I think he said he was the vice president of some high school political organization. He talked about the struggles of being an indigenous person in the U.S. and about falling into homelessness at one point. It was a very passionate speech and I wish I had gotten his name. This comes right after reports that Bernie altered his stump speech in Arizona to talk about the treatment of Native Americans and, you know, the genocide. In his Seattle speech, he said that we non-indigenous Americans owe them an incredible debt that we can never repay. I guess because in order to do that, we'd not only have to give back all of America, but also like, clone them a ton of people that we killed, and somehow reverse the devastation to their many cultures, etc. I really appreciated how much time he put into thanking and crediting different oppressed racial groups. He took the time to specifically address the differences in pay gaps between different races - something that many feminists fail to do. He addressed how young women are even worse off than men in today's fucked up economy - something liberals in general often fail to do. His speech wasn't perfect and he didn't say anything that was, to me, actually revolutionary. But I was generally pleased. He exceeds my expectations for politicians in general in a lot of ways. I'll be caucusing for Bernie this Saturday in Kirkland. I encourage everyone who could be involved this Saturday to do the same. I believe that Bernie can win the nomination and that we'd be a lot better off if he did, even if he still is a capitalist. If things get better under Bernie, who knows, maybe a real socialist could be next! 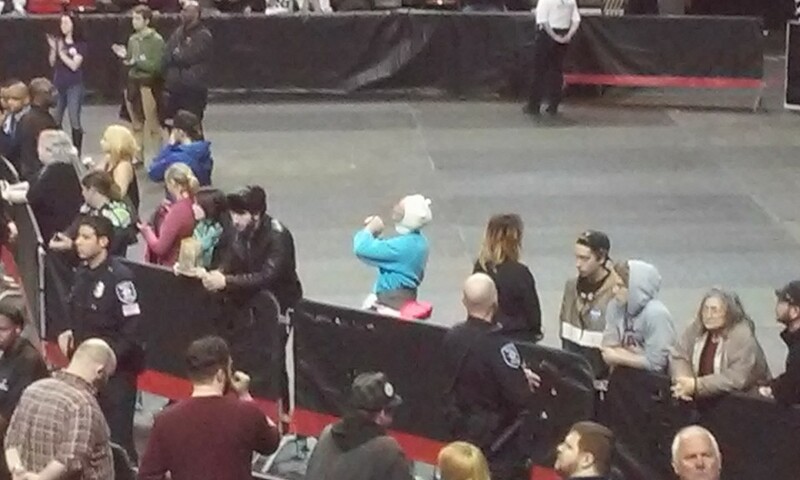 Finn the human came out for Bernie. Thanks, Finn.